If you grew up in the 90s, you probably saw one of the legendary ITT Technical Institute commercials in the wee hours of the morning. Now, you’ll probably never see one again. Today, ITT Technical Institute campuses have stopped enrolling students at all of its campuses. The abrupt decision to stop enrolling students came after the US Department of Education handed down a series of sanctions to the for-profit college on Thursday. One of the most damning sanctions handed down last week prevents ITT Technical Institute from admitting students who rely on federal aid to pay for tuition. The decision to block the company from taking students on federal aid is part of the federal government’s crackdown of for-profit schools, many of which have accepted billions of dollars in governments grants and loans. Of course, there’s nothing wrong with handing out loans for a higher education, but for-profit colleges often fail to deliver adequate job training and pressure new students into taking on students loans in order to pay the school. A shocking report from The Atlantic recently revealed that “students pursuing bachelor’s and associate’s degrees at for-profit colleges saw their earnings drop, compared to before they started the program.” This is because most students don’t finish their degrees, and in addition to earning less than when they had started, they became burdened by debt without technical skills. The sanctions set against ITT Technical Institute have been described as a “death sentence.” In addition to preventing the company from taking federal aid for tuition, the US Department of Education is requiring that ITT increase its reserves from $94.4 million to $247.3 million. The reserves are meant to support students in case the company closes. Students who have already started taking classes can still use federal aid as long as the school remains open. Students that have enrolled in ITT but have not yet started taking classes cannot use federal aid to finance their tuition. 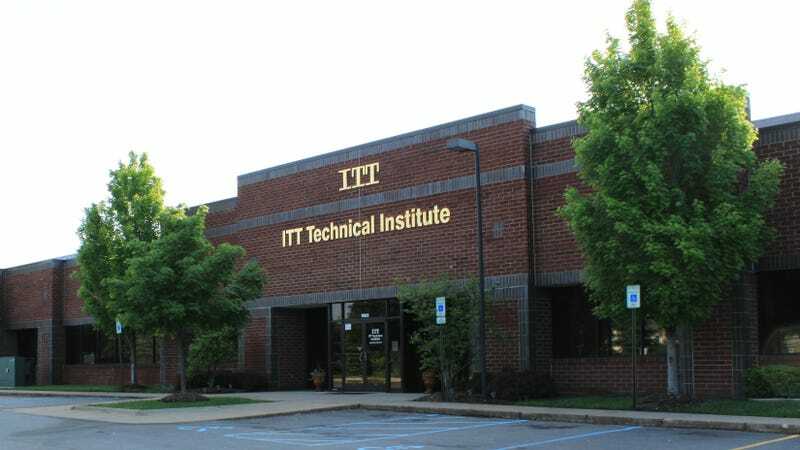 ITT Technical Institute’s recent troubles shouldn’t be much of a surprise to anyone. A simple Google search about the company reveals former instructors and students flat-out calling the organization a scam. YouTube is also riddled with bad reviews that I discovered just looking for one of the company’s commercials. Perhaps the saddest part about this entire fiasco is that ITT Technical Institute is just one of dozens privately held and publicly traded companies known as “for-profit colleges.” Companies like Devry, University of Phoenix, and dozens of others are operating by similar principles to ITT Tech. Although most of the other for-profit colleges have not been barred from accepting students using federal aid, we suspect that they will eventually feel the wrath of the US Department of Education’s ongoing crackdowns. And if you’re a student considering attending one of these colleges, I hope you consider a much better alternative: attend a community college.